Bienvenidos…Welcome to the Rainforest…green season has arrived. So enjoy the peace of it and the greenness it provides. Our mornings are normally beautiful the rain comes later in the day so get moving early and maybe an afternoon nap (guilt free in the rain haha). Our restaurants and tour companies are in full swing to make your stay here unforgettable and without the crowds more enjoyable. We recommend calling ahead to our fine restaurants beforehand because some will be closing for a quick holiday for themselves and staff. Always love this time of year being from the US I always look forward to the start of the NFL season. Catch all the games at Hawg ‘n’ Bill at the beach, Sancho’s and Byblos on the mountain, or Double Hook at the marina. Costa Rica celebrates their 196th year of Independence on Sept. 15. Quepos will be having its parade with children in traditional costumes, floats and festive marching bands. So if you are in the area come celebrate with a country that truly appreciates their Independence…. Pura Vida! Halloween is coming so get your costumes ready for fright night in the jungle. Marina Pez Vela will be having its annual Halloween bash as well as many bar and restaurants in the area. 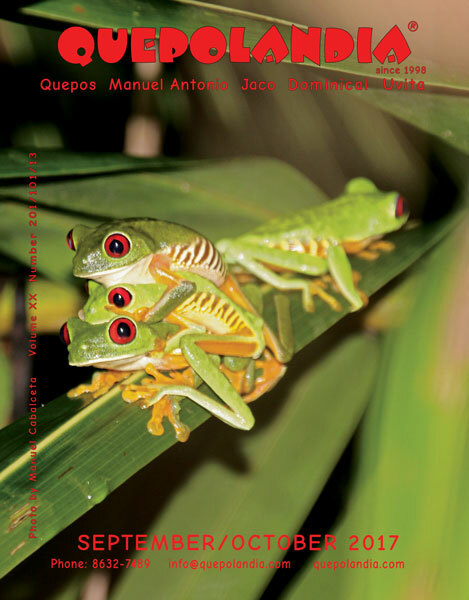 We want to thank Manuel Cabalceta from Manuel’s Tours for the great tree frog cover. We also want to welcome our new advertisers Casa de Amor, DHL, Hari OM, and Premier Wine and Food Company. Also, Paul Gerace, who has been our source for a number of great covers, has 2 new books of photographs. September/October is a double issue here at Quepolandia so we will be back to guide you in November. We hope you enjoy our magazine and it helps guide you through this enchanting paradise we call home. You can always follow and share us here or at facebook.com/quepolandia. We appreciate and welcome your comments. Happy Independence Day Costa Rica!! !